All this month, we're working on the half guard. Dónal decided to go through a version known as the knee shield or z-guard tonight. Essentially it was the same kind of thing I taught yesterday about maintaining half guard, except that you bring your knee across into their hip. That enables you to create distance as well as stopping them from bringing their weight down and/or forward, messing up their ability to pass. Dónal likes to lock his feet, which makes it harder for them to pull their leg free. However, a lot of people struggle with that, especially if they have short legs like me: the alternative is to shove your knee up into their chest, with your feet open. But be aware you don't let their leg free, meaning you need to keep hold of it with your hooking leg. If they are pushing down on your knee, flare your knee out into their arm. 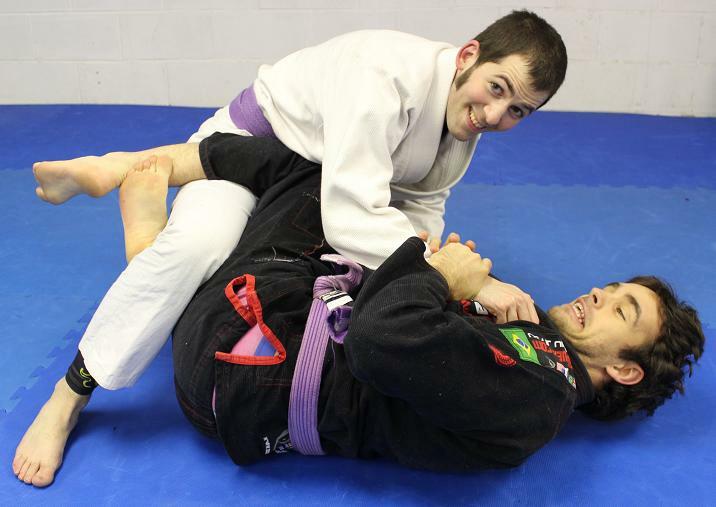 That should open up a gap: reach through it with your free arm to get an underhook around their back. As you do, pop up on your knee, sliding it out so you're on your kneecap. That should make it harder for them to drive into you and push you down.